Is it just me or are the men in our lives some of the hardest to shop for!? In my experience, guys don't ask for much, so there is nothing better than finding and giving the perfect, and often unexpected, gift. They might be hard to shop for, but it is fun searching for the perfect gift! 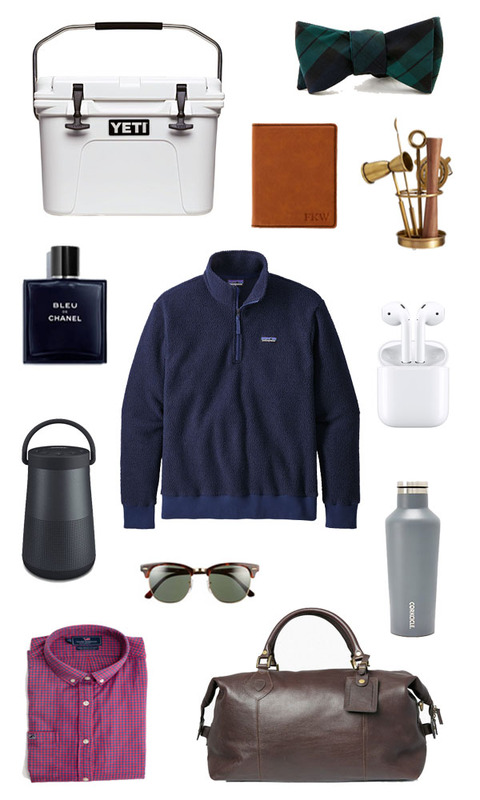 To help you do just that, I've rounded up some of my favorite gifts for all the men in your life - friends, fathers, brothers, and significant others included. I'm confident there is something for everyone on your list! For the men that love to travel, this weekender bag and monogrammable passport case will help them travel in style. Any music lovers in your life? If yes, then you can't go wrong with a pair of AirPods or this Bose bluetooth speaker (p.s. I've given this one in the past & it was a hit!). I think any guy in your life would be more than thrilled to receive a cozy fleece pullover, and if you're really at a loss, I don't think you can go wrong with this super sought after cooler - because who doesn't love bringing cold beverages on any and all adventures.